1/2 lb each of ground veal, pork and beef. 2 tbsp parsley finely chopped. 6 stalks of sping onions – finely chopped. 1/4th green bell pepper – finely chopped. 4 cloves of garlic – crushed fine. 2 tsp ground black pepper. 1 1/2 tsp honey mustard. Mix the first 12 ingredients together till well mixed. Drape the bacon in a loaf tin overlapping it till the base and the sides are covered. Pat the mixed meatloaf mixture in the bacover covered tin. Cover the meatloaf mixture with the remaining bacon slices. Mix tomato ketchup with brown sugar and the honey mustard. Mix well. 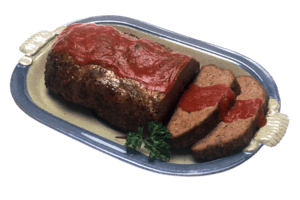 cover the top of the meatloaf with this delicious sauce. Place the tin in a pan of hot water. Bake in the oven for 1 hr. Half way through cooking time, baste with more of the sauce. Once done, let stand for about 10 minutes, before serving, with the sauce on the side. Note – One does not have to bake it in the loaf tin. You can place it on a ridged tray in shape of a loaf and bake it. This entry was posted in Meatloaf. Bookmark the permalink.